Candidates will learn the necessary skills and knowledge to instruct people in safe Working at Height practises and to qualify them to inspect and certify Personnel Harness & Lanyard Systems to a GA1 Standard (Report of Thorough Examination). instruction or training on a commercial basis. Duration: This is a one day course for experienced trainers with an existing training qualification. A second assessment day is strongly recommended for inexperienced trainers. 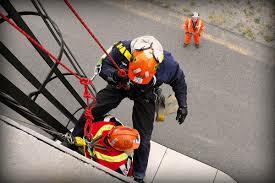 Certification and Accreditation: On successful completion of this Working at Heights Instructor course Candidates will receive a Working at Height Instructor Certificate and Harness / Lanyard Inspectors Card. we ourselves run, to help them gain confidence and experience in delivering their own Working at Height Training and Instruction. Refreshments: Tea, Coffee and Lunch is provided every day on all full day courses.